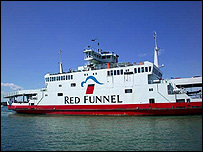 The owners of the Isle of Wight ferry operator Red Funnel are considering selling the company. Red Funnel, the original ferry operator to the Isle of Wight, has been operating from Southampton to Cowes on the island since 1861. The company, which is part-owned by the banking organisation HBOS, would be sold as a on-going concern and the BBC understands it could fetch £200m. Managing director Tom Docherty said no jobs would be affected by the decision. In a statement, Mr Docherty said NM Rothschild and Sons "have been gauged with a view to strategic options relating to the group's financing structure and ownership". "Notwithstanding this, it's very much business as usual," he said. "We've no changes planned in the senior management team or in our on-going commitment to provide a pre-eminent cross-Solent ferry service." The company started as the Southampton Isle of Wight and South of England Royal Mail Steam Packet Limited Company.